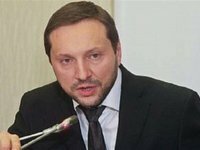 Ukrainian Minister of Information Policy Yuriy Stets has announced his resignation after a report on government program implementation. "Today, I am announcing my letter of resignation," Stets told other ministers on Tuesday, adding that the letter will be sent to the Ukrainian parliament. "A year ago, I promised that I [would] fulfill the four functions of my mission as Minister of Information Policy and [would] resign from my office one year after working in the Cabinet. I am, therefore, announcing today my letter of resignation…and it is today that I am going to send it to Verkhovna Rada," Stets said. He thanked his colleagues for their work and said he will continue "to defend Ukrainian interests," wherever he works. "Destabilizing the Ukrainian government at such a difficult time is to betray the interests of Ukraine," he also said. It was reported that last week Stets announced his intention to undergo the procedures required for the registration of his official letter of resignation. Previously, on October 27, he expressed hope that in December he would be able to report on having met all the targets and resign from his post.